I'm honestly surprised there hasn't been a thread directly made for ISRU despite how prominently it is mentioned in numerous Mars threads here at Nasaspaceflight.com. Do post commentary about the subject and especially new developments related to extracting and manufacturing resources on Mars, especially water and methane. Regarding the M-WIP Study, they've begun to consider the importance extracting Martian water is to both life support and propellant for a Martian Ascent Vehicle. On the side, I suspect somewhere Robert Zubrin of the Mars Society is laughing, although at least pleased some aspects of NASA are finally moving toward the water/lox/methane manufacture he championed over 20 years ago. But seriously, the discovery of abundant water/hydrogen as both ice and minerals thanks to the Odyssey and MRO probes has probably eased the transition toward ISRU. Now we have proof there are definite resources to use; both the hydrogen and carbon dioxide for the Sabatier reactions are on Mars. While glaciers are the most obvious source of water, the disadvantage pointed out is they: 1) outside of the poles, they're buried under a lot of regolith, and 2) become unstable when exposed because the ice naturally sublimates. It will take a lot of effort to dig it up, and after that you have to extract it asap before the ice evaporates. In a worst case, a base built on a glacier might tilt or fall apart if the area around it is unearthed. Methods are being considered for glacial extraction, but it considered a less mature option compared to the other 3 resource options. Outside of resource discussion, there is some acknowledgement NASA is indeed considering at least partial resource utilization; LOX production seems to be already on the table, with MOXIE via the 2020 rover being a prelude. So now it is coming down to deciding how the methane and water will be obtained. This in turn warrants further missions to demonstrate both Sabatier reactors and robotics to harvest material. As news develops for ISRU, do mention them here and inject the occasional opinion, so long as it relates to ISRU on Mars. Here are links to two previous ISRU threads. The amount of water needed for a NASA base as planned may be extractable from all kinds of sources. However the amounts needed for a SpaceX architecture with MCT and a colony with many people is much higher. IMO it can only be effectively extracted from glaciers. The regolith cover as determined by orbital radar is no more than 10m. That's not too much given there is a need for many thousands of tons of water. Removing a max amount of 10m of regolith may be a lot easier than mining the ice which is as hard as concrete at Mars temperatures. I don't see sublimation as a major problem as long as the ice is shaded from direct sunlight. Even sublimation needs the same energy as normal heating to liquid and then gaseous form. That's a lot of energy for much ice to sublimate and energy comes from sunlight. Building the base directly on a glacier may not be a good idea. Though if the regolith cover is 10m that may become a problem only when the base becomes large, becomes a city. My understanding of the findings is that they would not have any information about glaciers that have more than 10 meters of regolith coverage. I think there may be deeper ones, and that they could be drilled into directionally or horizontally to be harvested. However, there may also be boundaries between glacier and bedrock that could prove advantageous. Trying to avoid this from becoming clogged with SpaceX fandom, but I knew it would be brought up sooner or later. My only statement for SpaceX along with Red Dragon, in regards to ISRU, is that it seems the obvious candidate for field testing ISRU; the trouble with standard probes is that you end up competing for payload space with scientists - MOXIE was lucky to get room on 2020. I suggest holding off on MCT talk until SpaceX declares what's needed in September. 10 meters is still over 32 feet deep...as in over five and a half times the height of an average man...as in hundreds and hundreds of pounds/kilos of material...some of which may also be as hard as concrete and in irregular chunks dropped by ancient Martian seas and glaciers. Moving all of that will drain batteries hard, more so if nuclear power is limited if allowed at all. That's no idle work, and it is more conservative of energy to draw on easy-to-access regolith heavy in hydrogen, be it ice or gypsum. The best option for ice is akin to plans for exploring Europa; drill and use a crybot to melt the ice, essentially making a well with the vapor getting collected by the excavator above. Glacial ice isn't exactly the first choice, but neither is it off the table. Most likely if ice is considered it will have to be shallowly covered, as in 3 meters or less. It is a juicy fruit for ISRU, but unless you're flying to the (Martian) north pole it isn't easy to pick at the moment. There's still a lot they don't know about ice on Mars, obviously since we've only seen a direct hint of it via Phoenix (but no one's driven to the north pole yet). There's better knowledge about chemically-bound water via Spirit, Opportunity, and Curiosity which is why there's a slight favor towards it for the moment. I wouldn't be surprised if they opt for a little of both ideally, at least for something in mid-lattitudes; many of the sites for both the 2020 rover and human exploration state they're going for a mix of both kinds of water whenever possible. The argument for max 10m was that radar could see and measure regolith covers of more than 10m, not that they could not see water deeper than that. They do not have enough depth resolution to see covers less than 10m in radar reflections from orbit. So it seems there are no or no very large glaciers with regolith covers of more than 10m because they don't see regolith covers over glaciers. I understand this is not a SpaceX thread and acknowledged it by arguing both NASA and SpaceX situations. I don't think you can reasonably exclude the SpaceX situation from an ISRU thread. 10 meters is still over 32 feet deep...as in over five and a half times the height of an average man...as in hundreds and hundreds of pounds/kilos of material...some of which may also be as hard as concrete and in irregular chunks dropped by ancient Martian seas and glaciers. Moving all of that will drain batteries hard, more so if nuclear power is limited if allowed at all. I already argued that removing a regolith cover that thick is only worth it if you need a lot of water. There is also the chance that they find areas where the cover is only 1m deep as is the lower boundary of cover determined by the fact that less cover would cause long term sublimation of the ice below. That's no idle work, and it is more conservative of energy to draw on easy-to-access regolith heavy in hydrogen, be it ice or gypsum. That's only true as long as the amount of water needed is low. Extracting water from regolith requires a lot more energy than melting water from glacier ice. A basic summary of my reading of that document: "high importance, low TRL"
I think we all here already knew that The differences in system mass between a with-ISRU and without-ISRU mission are tremendous, making ISRU tremendously important. But our experience with "low maintenance low mass Martian bobcats and water isolation systems" is, let's just say, "lacking" - as is our quantification of the scale, homogeneity of mechanical and chemical properties, etc of the various potential resources. We've got plenty of broad orbital data and tons of spread-out individual surface analyses. But that does not a reserves characterization make. It's good to see the reality check, particularly on the "glacial ice" concept (the overburden problem, the sublimation problem, the rocks-and-sand-and-who-knows-what mixed in problem, the hardness problem, etc). Even though they're still being generous on a lot of cases, for example assuming that weathering has already basically mined the minerals for you in B, C and D. Maybe if you let purely ISRU factors determine the landing site, but scientists prefer sites where the strata haven't been weathered into a homogenous mess. But, who knows. Also, it appears that they're assuming nothing more than simple distillation, which is quite the assumption - they just leave it open with their "not addressed" remark on page 60. Distillation only removes non-volatile chemicals - to pick an example example, it won't remove the HCl from decomposing perchlorates. And even paired with RO, the best RO membranes tend to be attacked by chlorine, and the non-chlorine sensitive ones tend to be pH-sensitive. That is to say, there's some very significant engineering work and an awful lot of testing ahead. But also, the importance of the task means it'll probably get done sooner or later. Nice excavator design for loose soils on P.38. I worry about rocks jamming it up, though. Apparently they do too. That was a funny part of the NASA workshop about selecting landing sites. A glacier expert said, glacial ice is always very clean. Get a block of that ice into the habitat, let it melt and drink it. An expert on ECLSS was shocked. She said, get us a sample of that ice, give us 15 to 20 years development time and we will give you a space rated device that can make it drinkable. I guess the truth will be somewhere inbetween. ...and that beautifully illustrates how not all rocket scientists are experts. Of course, regarding ice, I'd hope for some testing before drinking it, but it sounds consistent with how I've heard frozen water can be surprisingly pure. The real limitation with glaciers on Mars is how to access them, hence why I stressed that particular resource; it's big and obvious but good luck rigging a solar-powered rover to dig it out. Yet, especially for mid and high lattitudes, the abundance is enough to keep them on the list. IMO, reading the M-WIP gave me the impression gypsum should be pursued. Aside from the mineral being water heavy, there is a very solid scientific motivation to seek it out: gypsum forms in seawater and hot springs. Wherever you find the stuff, odds are you will find many things related to the deep history of Mars prior to the dry Amazonian Era, with or without fossils. However, in fairness this could also be said of the other various minerals; gypsum just stands out as the least intensive to harvest, including the fact it's a soft chalk less abrasive to equipment. Of course, regarding ice, I'd hope for some testing before drinking it, but it sounds consistent with how I've heard frozen water can be surprisingly pure. On a planet full of ubiquitous toxic dust, IMHO that's beyond optimism. You'll be drinking perchlorates, hexavalent chromium and arsenic just from dust contamination alone. Indeed - but as you'll note in the article, they're looking for gypsum that's already been weathered to fine sediment - they don't even consider (apart from relatively quickly to dismiss it) hard rock mining. By contrast, geologists generally want their layers intact. But hey, you might get lucky and find a place with both highly weathered and bare, unweathered gypsum That's certainly possible. Hmm, just thinking here, are there any good routes to sulfuric acid production from gypsum applicable to a Mars environment? Sulfuric acid usually tops the list of most widely consumed important industrial chemicals on Earth, and I'm just thinking about future local production here. A glacier expert said, glacial ice is always very clean. I wouldn't even dream of calling that "very clean". And we're not constantly blanketed in a cloud of fine dust - that just comes from dusting events once every couple dozen years for a given location (which is why it forms stripes). Glaciers ability to trap dust is not only well known, but a very important part of glaciology - it's used to study past climates. There's no way that that is in any way pure and clean. Leading contention from Phoenix seems to be "frozen dusty brine". Glaciers can contain rocks, true. The water is still very clean. It was said the glaciers on Mars they were talking about contain very little rocky material. It would show up as scatter in the signal. From lack of scatter they can safely assume very clean water. The question is how did the glaciers form? If the glaciers formed by the accumulation of snow, then the ice can be clean. Then again, with thin layers of a light coat of dust mixed in and then melted, dangerous chemicals can dissolve in the water and contaminate it. Sublimating the ice could avoid contamination from non volatiles in the dust, but removing volatiles would be more complex. 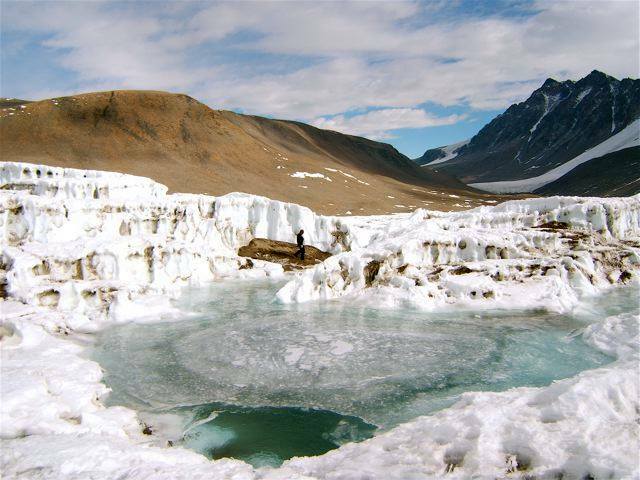 If the glaciers formed by ground water freezing, the water can be heavily contaminated. Considering what we know about Mars surface chemistry, water extracted from glacial ice will require testing and purification. When scouting base or colony locations, drilling into the ice and chemical analysis will be needed to determine which location has the ice requiring the least purification. My understanding is that glaciers form by precipitation. So if they did not form from precipitation they are not glaciers. Given the discussion I assume they are glaciers and have been formed by precipitation. That would make it likely that they do include dust. Glaciers that contain rocky material have gathered it while flowing. Quite possible that my line of thought is too simplistic and wrong. Not necessarily; we simply don't know what the Martian climate was like eons ago. The current one is full of dust storms littered with polluting fines (i.e. very powdery dust), but in a wetter era that would have been confined as silt and less of an issue. My educated guess would be that the more ancient the glacier, the more pure it will be, with layers formed in the Amazonian Era will have dust embedded. Ironically, the same fines would be perfect mining material as it doesn't need to be ground up, just shoved into a vat for processing. BTW, whenever there would be significant fuel production on Mars, there would be an excess of oxygen because rocket engines run fuel rich. CO2 extraction from the atmosphere would produce nitrogen, or rather a mix of nitrogen and argon, which is breathable. So a breathable atmosphere would be a welcome byproduct. Only CO2 removal should be necessary. Hmm... this is a semantics note, but I have a bit of a hiccup seeing the concept floated of just removing the CO2 from Mars' atmosphere and you have a useful atmosphere left. That's sort of like saying if you're looking to produce salt, all you need to do is remove the water from salt water, and you have useful salts. I would look at it a lot more as removing the salt from the water, not vice-versa. I think that's a misunderstanding. What I mean by CO2 removal is remove the rising CO2 from the breathable atmosphere inside the habitat. Otherwise it can be maintained by adding surplus oxygen from propellant production. No need for a closed loop ECLSS early on. Can wait with a closed loop system until it is a biological system, not similar to attempting closed loop on the ISS or in a spacecraft. Removing the CO2 is easy, just cool to -78.5 °C; −109.2 °F; 194.7 K at 1 atmosphere. There might be groundwater in certain places underneath permafrost. Permafrost is impermeable to liquid water, so makes a good cap rock that prevents escape to the surface. As you go deeper, the temperature must of necessity increase to a point that is not subfreezing anymore. At such depths, the overburden pressure is over an atmosphere, so liquid water would necessarily form. It is much easier to drill for such water--assuming it exists and can be found--than practically any other option on the table IMHO. It would take some prospecting for sure, but maybe not a whole lot, relatively speaking. The other strategy extreme seems to be to engineer for average conditions. That way the entire prospecting step can be eliminated, while success is guaranteed. But the latest round of studies has mainly succeeded in showing how difficult that is. Very old school (1970) study of groundwater in permafrost regions in Alaska. Of relevance to Mars ISRU however, IMO. Would b much more efficient... that's exactly what 'mining' the regolith is. It will naturally (gradually) recharge by condensing the atmosphere's load of water each sol. It's really more like farming, isn't it? If you just had fields of these hydrating minerals, it'd be more efficient than raw regolith, since you have to heat up all the regolith, but only part of it yields water. Very flexible on when/if processing steps are done as well. Once the stuff's spread out it can be picked back up early if you want some water at lower yields, Just left there if there's no need for it or collected and dumped into a storage pile if a new batch is ready to go back out. Of course somebody making maps is going to have to label the area Tatooine. It's practically mandatory. Desert planets are a surprisingly overdone theme in sci-fi I realize. Well in that case I'd suggest calling the place Beta Colony except for the issues around such a name. Is there any concrete idea about sizing a reusable soil-mining ISRU unit? Suppose you have a vehicle which can deliver and deploy up to 40 tonnes of payload to the surface of Mars, in a cross-section roughly the size of the Falcon 9 fairing. Is that enough for a reusable LOX/CH4 ISRU system -- one which can be deployed by the vehicle, process regolith to extract water, convert the water and collected atmosphere into LOX+CH4, fill the vehicle's prop tanks, dump the used regolith, and start again? Kicker: it needs to be re-stowable in the vehicle, so that the vehicle can head back up to orbit, transfer the collected propellant to a tanker, and then return to the Martian surface in another location to start again. This looks very interesting. One step production of carbon dioxide (CO2) and water (H2O) into ethylene (C2H4) and oxygen (O2). That is, making methane requires twice as much water as ethylene as well as having a lower density and Isp compared to ethylene! When liquid fuels such as ethanol and n-propanol were included, the total solar-to-fuel efficiency was 2.9%. Then you've got more exotic stuff, like CO/acetylene / O2. Acetylene (C2H2), and CO to stabilise it, and reduce the fierce combustion temperature a little, while getting rather better ISP than CO alone. Under half the hydrogen of C2H4/O2. Plus, at least one process for C2H4 begins with CH4, so 'flex fuel' generation might be possible, tuned to available water and power. Although Ethylene may not be used for prop it still is useful in the creation of synthetic materials fibers such as polyester. I am sure that the Colony will find the mass manufacture of polyester based materials cloths/ropes/etc will be very useful. Plus ground equipment may use Ethylene and LOX to power heavy mobile equipment via ICE (internal combustion engines) or Fuel Cells. Using less energy to make also means that less energy is stored in the liquids and released when burned. For Rockets that is a bad thing but for rover/ground equipment that is not a major concern. Forgive me for not reading the whole thread but has there been discussion of extraction of atmospheric water. I do believe this was studied using adsorption and has the advantage of being relatively simple. Another issue I don't think has been mentioned is that food imported from Earth will contain carbon and more interestingly hydrogen. Ordinary metabolism creates CO2 and H2O. In a well sealed environment with water reclamation, humans will actually generate an excess of H2O and this H2. This may not help if you want hundreds of tonnes of propellant, but if you want a few tonnes, that bit of H2 might be usefull. It certainly qualifies how much water you think you might need for life support. Although discussion of importation of hydrogen may be seen as OT, I think it is relevant given the sheer cost/difficulty of going after ISRU hydrogen (versus Oxygen). And in the context of the relative ease of importing hydrogen. 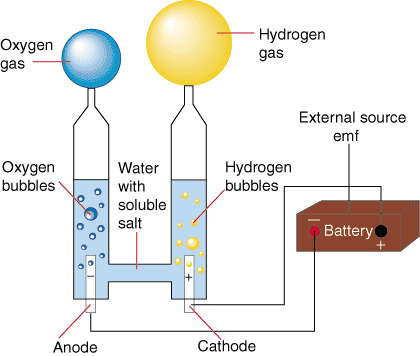 One way to import hydrogen is to land amonia (NH3) which is 17% hydrogen by mass and is is dense, stable and storable. The bonus is that you've also got a reserve of Nitrogen. That cuts the problem down to a third. Yes you need power/mass to process NH3 but you then don't need power/mass to extract native Nitrogen/Argon. 1. Water vapour varies by season and and location but is to some extent predictable. It also requires relatively non complicated and robust equipment. It is certainly capable of producing life support quantities (hundreds litres to several tonnes or more depending on power source). I dispute the need to source local hydrogen for small scale exploratory missions so I'm happy to simply have a local source of life support water. However this method can in theory supply enough hydrogen for a bare-bones ascent. 2. This method is limited to areas where there is reasonable depth of soil that is not too rocky and not too compacted. One can imagine relatively robust scrapers. Not exactly high-throughput by Earth standards but sufficient to accumulate enough soil (hundreds of tonnes) for the extract of a modest quantity (5-20 tonnes) of water. Like any activity that engages soil this is subject to unknowns. Uneven depth. Uneven consistency. Clogging. Damage. Repair. I cannot see this being done as an automated process. However it could be semi autonomous with day by day radar imaging and sampling. Having said this, any scale implies robotic maintenance and replacement of ground engaging tools (blades, teeth). It is by no means straight forward. Another issue that comes with scale is that if you have thin soil you have to cover a sizeable area and you start dealing with specialised transporters. 3. I concede this might be a possibility near a site of interest. Firstly as a matter of engineering this ups the scale by at least an order of magnitude since you're interested in the ice, not the overburden. You have major issues with wear and damage and replacement of parts. It also takes time and a lot of energy. When you get to the ice you may only be dealing with a thin layer. You also have to deal with very hard ice which is laced with abrasives and which you have to recover quickly. Besides the engineering issue you are now skating close to planetary protection issues. 4. I have reservations that any substantial thickness of ice will be found at a site of interest at a depth that can be reached by realistic boring machinery (say 30m, but even 100m may not find this type of ice deposit). In theory this is an easier process than the above. You just drill a hole and inject hot air and recover the water vapour. Although it does not require the same kind of machinery for open cut work, its still a difficult process even on Earth. The worst thing is that when you find a deep source of ice you are almost certainly running into planetary protection issues - until that area has already been subject to very careful study and deemed not just sterile but incapable of being infected with Earth organisms. I haven't even begun to talk about all the other engineering issues including what happens to hydraulics and bearings in near vacuum. The erosive and corrosive nature of the materials involved. And the demands for power, power transmission, batteries or chemical fuels. I feel this sort of thing belongs in a specialised thread. So. All I'm saying here is that my belief is that ISRU on the scale that would sustain a settlement or a SpaceX style launch requires a lot of hardware and a lot of stuff that needs maintenance/repair and quite probably human control if not localised tele-operation. In short, any mission that requires a lot of return-to-earth fuel is begging for so much mas to be landed on Mars that you might as well land the hydrogen or methane you need instead. On the other hand, if you're purpose is scientific/exploratory life gets a lot easier. For a start it makes sense to limit the amount of ISRU propellant you need (in other words an indirect return). Secondly what methane/hydrogen you do need for the ascent might as well be landed as part of the cargo (which will be a lot bigger than the few tonnes of methane needed). And thirdly to the extent that you are game enough to make some of the hydrogen you need, its going to require a lot less plant and equipment to use atmospheric water vapour. Since my background is in electronics for mining machinery I'd welcome a separate thread on the mining hardware front. Its just not that easy, even on Earth. I would love to see a mining machinery thread. I don't think we have one at this time. If, and only if, ISRU seems a cheaper, or more reliable way of doing it for a given mission, including development costs. Methane and oxygen also exist in earths atmosphere, nobody ISRUs, because you can get them in better ways. A lot of the posts in this thread are at best theoretical concepts with regrettably few ties to $ and W.
If, and only if, ISRU seems a cheaper, or more reliable way of doing it for a given mission, including development costs. Methane and oxygen also exist in earths atmosphere, nobody ISRUs, because you can get them in better ways. (Buy them) A lot of the posts in this thread are at best theoretical concepts with regrettably few ties to $ and W.
Right. Waaaay back at the start of this thread, the OP pointed to a NASA presentation showing the total mass to Mars was much lower for a complete CH4/O2 ISRU system than for Oxygen-only ISRU. Well, sure, but $'s burned in the process may not be optimized in the most mass-efficient choice. I don't think many are arguing against full ISRU as the long-term sustainable path. Still, it may be the case that shipping say, Ammonia, from Earth to give you both Hydrogen and fixed Nitrogen at the outset while efforts to generate Hydrogen locally are ramping up may be the best initial value to get things going. (My own scientific training is in biochemistry, so I can comment with more -that is to say nonzero- authority on these chemistry issues than for most of the other very interesting topics on this board. Nitrogen fixation, for example, is hard.) No one I have seen is suggesting shipping Ammonia from Earth to Mars as a long-term solution. That's what Ceres is for, silly. If the choice were between..
A a sensible small scale scientific exploratory mission that imports hydrogen in a stable form and in small quantity and uses indirect return. B a ramping up of robotic ISRU to a scale necessary to support Musk's architrcture that puts off an actual manned mission another 10-15-20 years. As you mentioned BFR, I chose C. Human operated ISRU. Happily that's not the choice, though. B is no more than 3 "Musk years" later than A (which is by no means happening tomorrow) and so very much more capable. We could have done Option A back in the 1990s when it was suggested, but nobody wants to pay for it. Not an option. SpaceX is working on Option B. Probably will be done within 10 years, if it works at all. This is the only option being funded and it's cheaper. There is no "If the choice were between" for Mars exploration. SpaceX may not be able to pull it off, but it's the only game in town. To get those humans there to do the ISRU you need to get them there and back and thus you go back to option A first. How so? They go there, get ISRU going and fly home. No option A with hydrogen needed. Well I don't agree here. If you want to know what I honestly think. I think that there will probably be small scale scientific/exploratory missions initially. I also think that its quite likely that the US won't be the main actor because of its political/cultural/economic problems. I also think that when the initial missions occur they will benefit from very much lower launch costs, new technology and from fresh thinking. So mid 2030s is my best guess. In that kind of time frame, we'll either see other competitors to Musk that go for mostly reusable boosters, or a British/European SSTO space plane (see my other thread). I remain highly skeptical of large scale/colonisation ideas. Both for reasons of business case and for reasons that go to the dubious motivations behind such plans which I wont go into here. I'm definitely in the camp of lets do it. But I also maintain that you have to walk before you can run. You pre-land a small quantity of methane and the problem is solved. The whole story line about ISRU derives from the original assumption that its expensive to get mass into low Earth orbit (and thus hideously expensive to get to Mars). Now that its getting a whole lot cheaper to get stuff to low Earth orbit, getting a few tonnes of methane to Mars surface is becoming a trivial problem relative to the overall cost of the mission. Remember that eventually its development costs that really bite and the simpler it is and the more robust and less risky it is, the less development cost and the sooner we get there. Oxygen ISRU for small scale exploratory missions is a worthwhile goal (because we need to breath too). And since it doesn't require complex operations and maintenance its also suitable for pre-landing. Are "planetary protection" issues likely to put a spoke in the wheel of any planned extraction of Martian water for ISRU? They certainly make it a lot harder to just dive in with the sort of mining needed for colonisation scale ISRU. Perhaps this issue alone would make it "easier" to make use of hydrated minerals as a source of water and steer away from ice (at least initialy)? No. If planetary protection protocols effectively stop human missions to Mars then the protocols will be changed. The planetary protection issue is one thing that steers me towards harvesting water from the Martian air, rather than soil. My point is that it makes a difference whether your aim is limited exploration or its outright colonisation. The former can be achieved without mining. The latter probably cannot be achieved without mining and quite probably will venture into richer sources of subsurface water if at all available. What does "a solar-to-ethylene energy efficiency of 1.5%." mean? 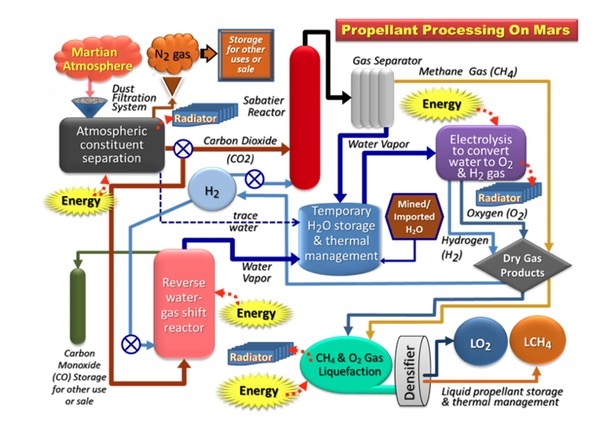 "Engineering Mars commercial rocket propellant production for the Big Falcon Rocket"
In Part 3, one commenter states, "...the problem with a nuclear system would be getting rid of the rejected heat as there are no longer any large bodies of water on Mars." And surely large nuclear plants would require significant mass for heat rejection systems. How to minimize that mass? I broached the possibility of a "supraglacial cooling pond"; presently exploring questions on required pond dimensions and radiator mass. An alternative source of oxygen is to extract it from perchlorate salts. Although getting rid of the chlorine may cause a few problems. There is quite a difference between human missions to Mars and colonisation. Small scale missions can do well without ISRU sourced hydrogen.